Whilst holidaying in the Dominican Republic back in 2004 I had my 1st experience of Kitesurfing. I knew that I wanted to give this a go as soon as I saw it. During my 1st lesson I had already made my mind up that I wanted to become an Instructor and get smiles on the students faces as big as mine. During my 1st year as a Kitesurfer I travelled to Malaysia, Thailand, Vietnam spending many weeks practising and increasing my ability. I even got roped in to assisting instructors on my travels. I obtained my BKSA Instructor qualification within the next 12 months and began working part time for other schools locally and in Camber sands and Hunstanton. kitesurfing was beggining to take over my life now and an opportunity arose to set up a Kiteschool in Sri Lanka. After returning from there I decided to set up my own UK school based in East Anglia but flexible to teaching locations. I gained the Senior BKSA Instructor qualification and also attended the IKO Instructor course. During the winters I decided to continue to work internationally as the weather is cruel to students here in the UK during these times. Last winter I accepted the offer of the position of School Manager and Head Instructor at a Watersports/Kiteschool in St Lucia. I am now back in the UK and really looking forward to getting more students smiling broadly and whooping with excitement! Be prepared to get addicted...!! I have also entered the world of kite repairs offering a range of services to the needy to get them back on the water with the minimal of delay. I use modern and safe equipment to enable students to get the most of of the experience. 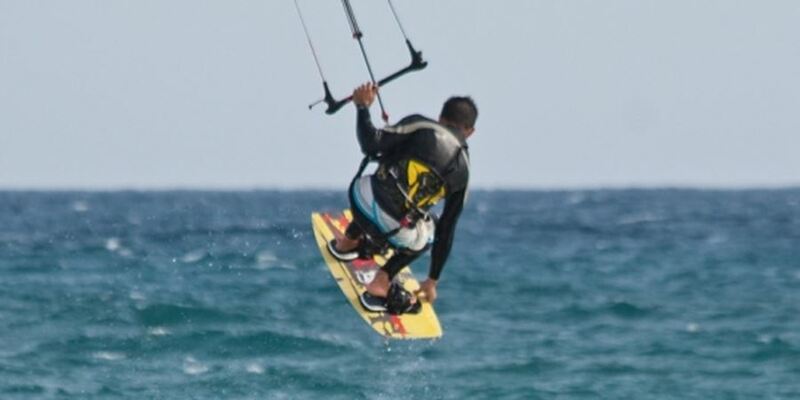 A combination of Ozone, Starkites, Liquid Force and Flexifoil brands with a large range of trainer and LEI kitesurf kites, harnesses, Bouyancy aids and helmets. Harnesses, Bouyancy aids, Helmuts, Safety Leashes. Kites, and Board equipment all included. Wetsuits may be arranged with prior notice of size etc. but it is better if you have your own. Cancellations made 5 days before Lesson Date will be refunded 50% of the amount paid.